Heat a china dish containing about 1 g copper powder (Fig. 1.10). The surface of copper powder becomes coated with black copper(II) oxide. Why has this black substance formed? This is because oxygen is added to copper and copper oxide is formed. 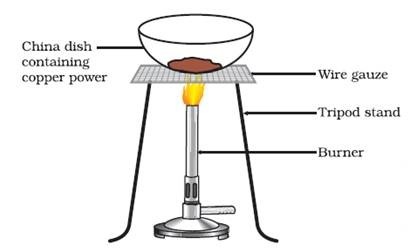 If hydrogen gas is passed over this heated material (CuO), the black coating on the surface turns brown as the reverse reaction takes place and copper is obtained. If a substance gains oxygen during a reaction, it is said to be oxidised. If a substance loses oxygen during a reaction, it is said to be reduced. During this reaction (1.29), the copper(II) oxide is losing oxygen and is being reduced. The hydrogen is gaining oxygen and is being oxidised. In other words, one reactant gets oxidised while the other gets reduced during a reaction. Such reactions are called oxidation-reduction reactions or redox reactions. In reaction (1.31) carbon is oxidised to CO and ZnO is reduced to Zn. In reaction (1.32) HCl is oxidised to Cl2 whereas MnO2 is reduced to MnCl2. From the above examples we can say that if a substance gains oxygen or loses hydrogen during a reaction, it is oxidised. If a substance loses oxygen or gains hydrogen during a reaction, it is reduced. Recall Activity 1.1, where a magnesium ribbon burns with a dazzling flame in air (oxygen) and changes into a white substance, magnesium oxide. Is magnesium being oxidised or reduced in this reaction? 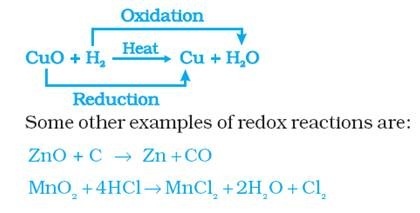 1.3 HAVE YOU OBSERVED THE EFFECTS OF OXIDATION REACTIONS IN EVERYDAY LIFE? tarnished in this manner. Have you noticed the colour of the coating formed on copper and silver? When a metal is attacked by substances around it such as moisture, acids, etc., it is said to corrode and this process is called corrosion. The black coating on silver and the green coating on copper are other examples of corrosion. spent to replace damaged iron. You will learn more about corrosion in Chapter 3. Have you ever tasted or smelt the fat/oil containing food materials left for a long time? When fats and oils are oxidised, they become rancid and their smell and taste change. Usually substances which prevent oxidation (antioxidants) are added to foods containing fats and oil. Keeping food in air tight containers helps to slow down oxidation. Do you know that chips manufacturers usually flush bags of chips with gas such as nitrogen to prevent the chips from getting oxidised ?